Solo: A Star Wars Story can't really seem to catch a break. At this point, it's the lowest-grossing movie in the history of the franchise, was riddled with production problems and, even though the reviews were far more positive than negative, it simply came and went and didn't seem to have that memorable quality that many associate with Star Wars. Now, to add insult to injury, the movie won't be in the running for Best Original Score at the Oscars for a rather ridiculous and embarrassing reason. 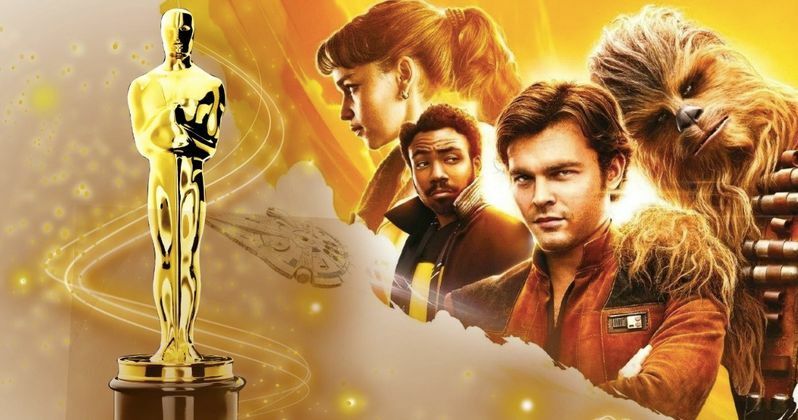 According to a new report, Solo won't be amongst the movies considered in the first round of voting by the Academy for Best Original Score, simply because someone at Disney forgot to submit it for consideration on time. The deadline was November 15. For companies as big as Disney and Lucasfilm, this is a bizarre oversight. John Williams helped compose themes for the movie, but the man has more Oscar nominations than he could ever know what to do with. John Powell did the heavy lifting and, unfortunately for him, his work in a galaxy far, far away won't be getting any Oscar love. Even at their worst or most divisive, virtually every Star Wars movie has a great soundtrack to its name. Much of that has to do with John Williams, who has scored every single movie in the core saga. Michael Giacchino stepped in at the eleventh hour to score Rogue One, with John Powell tackling Solo. Though, Williams did offer to help compose a theme for Han Solo in the movie, adding his magical touch to the soundtrack. An Oscar nomination or two might have helped to ease the sting a bit for Lucasfilm on this one, as it's really the first big misstep in the Disney era of Star Wars. But Solo isn't the only one left out in the cold this year. Several other scores have also been disqualified for consideration this year, and they're all maddening for their own various reasons. Best Picture hopeful Green Book also won't be considered for Best Original Score. The score, composed by Kris Bowers, was disqualified since the movie uses other sourced music very prominently throughout. Three-time Oscar winner Michel Legrand also won't be getting a nomination for his work on The Other Side of the Wind, the final Orson Welles movie that Netflix stepped in to finally help finish. Again, the issue raised has to do with more sourced music being heard throughout the movie's runtime. Lastly, and possibly most painfully, the score for Mandy, the crazy and critically-heralded Nicolas Cage movie from director Panos Cosmatos, won't be competing in the Best Original Score category. Johann Johannsson provided his final score for the movie before passing away and it's certainly the sort of thing the Academy would have paid attention to. However, since Mandy was released on VOD platforms before wrapping up a theatrical qualifying run, it can't be considered for any Oscars at all. The Academy Award nominations will be announced on December 17. This news was first reported by Variety.